Last week I did something crazy. 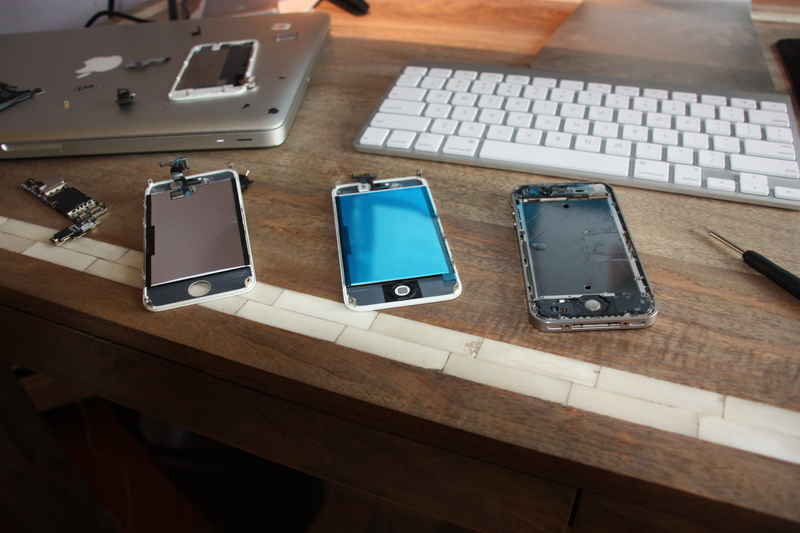 I voluntarily took apart my iPhone 4S and performed surgery. 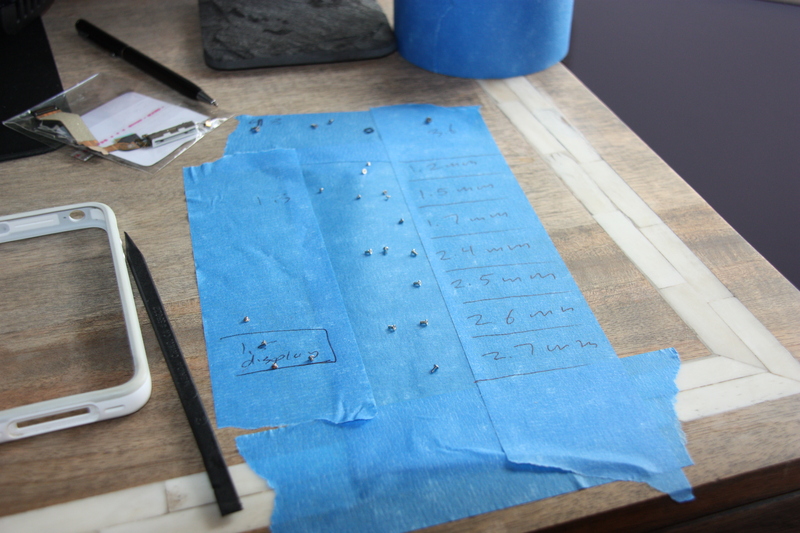 I had an entire desk (ok, a very very tiny spot) filled with really tiny screws, and various small parts. 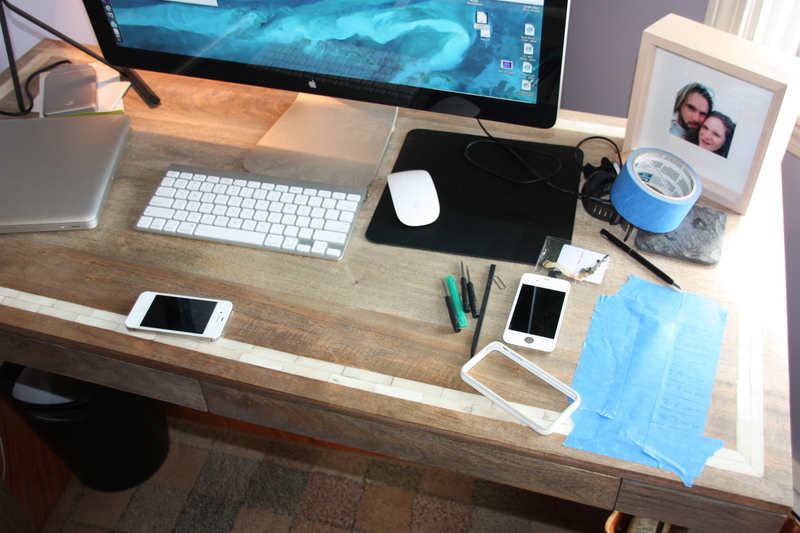 I was 80% sure that my phone wouldn’t work after I put everything back together. Amazingly, the phone endured the nearly 2.5 hour procedure and came out better than ever before. Why would anybody be crazy enough to do this? Well, my screen and dock connector both had gotten water damage. On a not-well-planned run a few months back, it started to absolute downpour at mile 6 of 10 and I was wearing my phone on my armband, listening to tunes. The rain was coming down SO hard, it was the equivalent of being in the shower – or jumping in a pool. For the entire final 30 minutes of my run. As a result, my screen contained water damage that no matter of drying-out would fix, and the dock connector was permanently damaged. The phone would still charge, however, no apps using external audio would work. The contacts on the dock connector were corroded and the phone thought it was perpetually connected to a dock accessory. There IS a work-around for iOS 6 jailbroken phones, but after upgrading to the iOS 7 beta, I was out-of-luck. Since it was only a matter-of-time before I upgraded to the final iOS 7, I knew I had to finally fix all this non-sense. The initial power-up freaked me out. Amazingly, the Apple logo showed up. I was feeling optimistic. That optimism quickly faded when it was stuck on the Apple logo for nearly 4 minutes. However, it eventually kicked over and booted up. It worked flawlessly. I was floored. For good measure I performed a fresh install (without backups) of iOS 7 beta 5 and performance was great. After working so long with spots and smudges on the phone, and no in-audio app (no loudspeaker music was really the main thing), it was like having a new phone. I put my bumper back on and one of these days soon, I will grab a new screen protector as well. Why go through all this effort? The risk? This is a good question. One I also asked myself repeatedly, especially considering there will most likely be a new iPhone coming out within the next few months and my contract will be up in October. I have gotten a new iPhone every 2 years or so since the original iPhone. But… I think this cycle will be different. 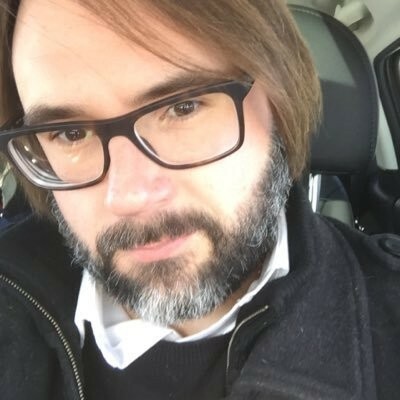 Besides that it seems like the new iPhone coming out this cycle will be underwhelming (at least, according to current rumors), my iPhone 4S has proven to be the best iPhone I have owned to date – and besides maybe LTE connectivity, has mostly everything I could ask for. Even the camera is pretty damn good – and I have yet to see iPhone 5 shots that really make my iPhone 4s camera seem dated. My contract will be up in October. So, this is the perfect time to take advantage of migrating to T-Mobile, with the Bring-Your-Own-Device strategy. My AT&T Contract currently charges me about $170/month for my family plan. If I moved to a comparable plan with T-Mobile, it will drop to about $100/month. That’s $840 a year that I would save, and far from chump change. It’s strange days lately – all costs-of-living just seem to outpace any possible way to make more money (kids and a house tend to do that), and saving money is more important than ever. I was amazed at how “easy” this type of repair was to do myself. It took a lot of guts, a good chunk of time, a LOT of patience, and a bit of finger-crossing, but I feel it was worth it. 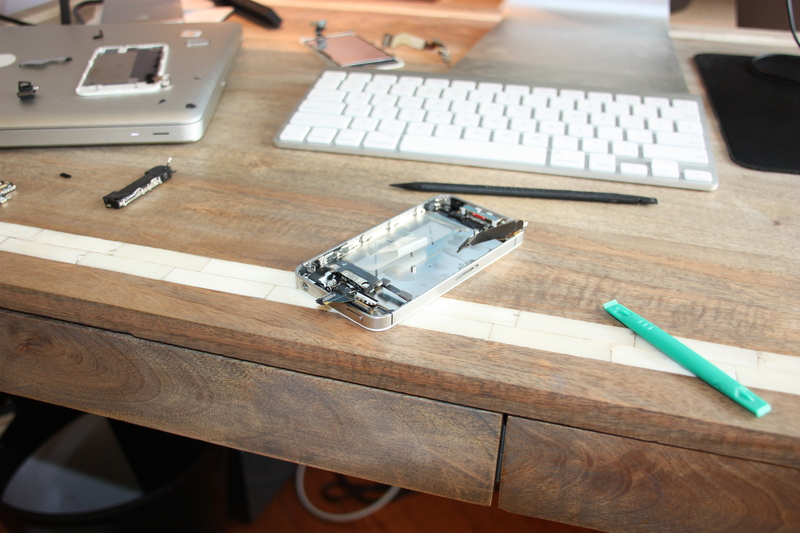 I’m hoping this iPhone 4S will chug on for a while longer – and that this repair will prove itself a wise move. This entry was posted in Tech and tagged DIY, frugal, iphone, repairs. Bookmark the permalink.